All transactions are safe and secure with a reliable history in online purchasing behind each of our associates. 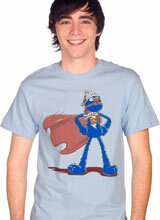 Buy the Super Grover t-shirt to own Sesame Street clothing and merchandise. Super Grover is the resident superhero of the Sesame Street gang, even if he isn't always very helpful. Posing as Grover Kent, a mild-mannered doorknob salesman in Metro City, Super Grover comes to the rescue wherever and whenever he's needed. Wear this funny tee to show people that you support the fuzzy blue hero. This Sesame Street design features him standing with his classic cape, helmet and the lightning bolt 'G' logo on his chest. Wear it with an Oscar the Grouch Sesame Street hoodie sweatshirt and it will be all good in your hood. In addition to the Super Grover tee above, browse the Sesame Street Clothing Gallery for more apparel like men's and women's clothes, kids shirts or hoodies.